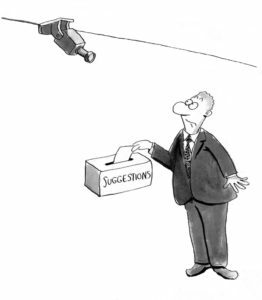 CEOs are often afraid to use a suggestion box. But there’s a lot of information available in the crowd. Crowdsourced answers and information from your internal team can you lead to a lot of innovative and effective ideas, and is often far less resource intensive than sifting through Big Data. Far from fearing some Q&As with their employees, CEOs should embrace asking questions—and the tools that can help them get the most effective answers. To be fair, it isn’t just CEOs who fear asking questions. Research shows that most of us think asking questions will make us seem less competent. We’ll often just keep our heads down rather than attracting the kind of attention that the suggestion box draws. The problem is worse for anyone in a leadership position, including CEOs. Standard fears of looking stupid are compounded by the fear of being seen as inadequate for the position. Leaders are supposed to have to have all the answers, and to know where their team and organization are headed at all times (or so the thinking goes). Asking questions, they fear, might be taken as a sign that they don’t know what they’re doing and aren’t up to the job. In the cutthroat corporate world, some fear that asking questions will be taken as a sign of weakness: actively opening up to outside input is a type of vulnerability. Why advertise an apparent chink in the armor? There is a tendency to act as if [asking questions is] a deficiency,” said Garret Keizer, author of Help: The Original Human Dilemma. “That is exacerbated if a business environment is highly competitive within as well as without. There is an understandable fear that if you let your guard down, you’ll get hurt, or that this information you don’t know how to do will be used against you. Ignorance and close-mindedness are bad armor, though. And asking questions isn’t the bad kind of vulnerability. It’s the good kind that show flexibility and a desire to constantly improve. While we think we’ll be seen as less competent for asking questions, we actually tend to see others as more capable and more confident when they ask questions. The more complex or uncertain the issue at hand is, the more asking questions is seen as an act of intelligence and skill. CEOs should also consider the effects asking questions has on the team members who are asked. When their input is sought, they feel more valuable, engaged, and capable—and these feelings will show up in their work ethic and their output. Far from being seen as weak, incompetent, or bad leaders, CEOs who ask questions and seek input from their internal crowds are seen as strong, capable, and empowering leaders who make the most of their teams’ resources. Suggestion boxes are the most common form of input seeking in the corporate world, but they’re not especially effective. Whether a physical box by the water cooler or a virtual suggestion submission form, they’re passive one-way communication tools. They don’t show real engagement on the management side, and they don’t inspire much engagement from employees. They’re also far too open ended, and only allow for one individual’s suggestion at a time. The right open source idea management software can be adapted to address any number of specific issues, seeking targeted input based on specific questions determined by the CEO. This method shows management’s openness to new information and ideas. A more consciously curated virtual suggestion box signals and inspires real engagement and provides an effective problem-solving platform. When you have a robust and responsive information crowdsourcing system in place in your business, you’ll have a team that has a greater sense of ownership over the tasks they perform and the output they produce for your customers and clients. You’ll have a constant stream of new ideas and incremental improvements in all areas of your operations, from company culture to strategic planning. And you’ll have a CEO and leadership team that is respected and responded to with delight instead of dread. Ask questions, get answers, and even let the crowd chime in on which solutions are best for your business using The Vision Lab fas your internal suggestion box. Get over the fear and get into the game by letting your team take the lead. You might be surprised just how far they can take you. Let us know what you think in the comments below! Trevor is the CEO of The Vision Lab, which helps companies transform by tapping into the wisdom of employees. TVL delivers actionable results using advanced AI and deep learning to analyze employee ideas at hyperscale.